If you would like to receive regular information and our latest special offers from us and The Hong Kong Jockey Club, simply provide your contact information and you receive the most up to date information from us. You can always unsubscribe at any time. *Please fill in if you haven't yet provided your e-mail address to the Club before, or if you wish to change your e-mail address from our record. For security reasons, our staff will call you at your registered correspondence phone number to confirm your request. The commencement date will be 7 working days after the phone confirmation. 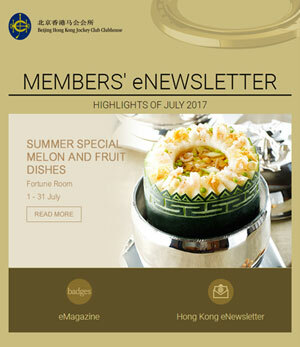 The purpose of the subscription is for the Club's e-News only. You may also visit beijingclubhouse.com for the latest news and promotions. Copyright Â© 2000-2019 The Hong Kong Jockey Club. All rights reserved.